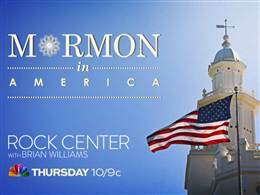 I just finished watching NBC’s Rock Center: Mormon in America program. For the most part, I thought it was very well done and probably as good as could be expected. Given that the main premise seemed to be that the LDS faith is not well understood by the majority of Americans, it seemed like a fairly good effort to portray different aspects of The Church of Jesus Christ of Latter-day Saints. Obviously, 40 minutes of airtime is inadequate to cover such a big topic. I thought that the interviews with members and especially with the one family were very good, and I would have liked to see more of that, as I think that is where you really see what the Church is and what it means to its members. Although I think the former members added an interesting perspective, it seemed odd that those segments received so much time. I think it would have been better to allow an active church member or leader to answer questions about garments and the temple instead of a former member. I appreciated that the show portrayed a feminist and a gay man that are both active church members, but I wish that more time had been given to other, more core beliefs. It was interesting that mention was made of Moroni’s angelic visitation to Joseph Smith, but there was no mention that we believe that Heavenly Father and Jesus Christ also appeared and spoke with the prophet. I expected some mention of our belief in a full restoration of Christ’s church, ordinances, and authority. I think they easily could have distinguished between our chapels where regular services are held and to which anyone is welcome, and our temples, that are more sacred, and where only members with recommends are allowed. This distinction was not made, and the viewer could have the impression that members are not welcome at any LDS service, which is not the case. More could have been said about the sacredness of temples and why only worthy members are allowed to enter them. It was odd to me that they showed a short clip of a meeting with the congregation singing a gospel-style hymn. It didn’t bother me really, but is definitely atypical, and probably left some with the wrong impression. I was bothered at the picture of garments. Obviously anyone can find such a picture, but after talking with members and even former members and being told about the sacredness of garments, it seemed rather insensitive to display them as they did. I loved what they showed about the welfare and humanitarian work of the church. It would have taken a whole show to adequately cover this topic alone, but it was nice that they devoted some time to this. It was interesting to watch, and I hope that many viewers have a better understanding of LDS beliefs and people. Did you watch the show? What did you think about it? Since they were relating it to Mitt Romney, I think they could have explained just a little more about the “lay” ministry, explaining that most members of the church have some type of calling of service. FYI: MSNBC did a fairly “fair” show on “The Making of a Candidate” about Mitt Romney that explained quite a bit about the church too. I have to admit, since it was produced by MSNBC I was surprised it was as fair as it was.